Governments and private corporations have an increasing interest and investment in big data. From social media posts and network usage to urban occupation, every activity produces data to be quantified, analyzed, and optimized in the production of new marketable and optimized forms of citizenship and governance. However, the data that is produced does not necessarily constitute an objective representation of all citizens. While smart-city governance is based upon formal logic and syntax, the question remains: How can big data meaningfully impact people’s lives or even accurately reflect their behavior and experiences? What effect does computational urbanism and smart city technology have on the identity of a city? How can policies incorporate big data to positively contribute to the social well-being of urban populations? Productive Disagreement Series: Syntax vs. Agency opens up the discussion about analytical and design biases within contemporary forms of computational governance and city making. What identities, forms of citizenship, and politics are produced within current forms of digital representation and analysis? What kind of agency do this new forms of representation produce? Who is empowered as a result of digitally based forms of civic knowledge? A panel of urban policymakers and analysts, technology theorists, and media arts experts take on the current implications and short-term impacts of digital infrastructure on the construction of the built environment. This event is presented as part of the Storefront’s exhibition Control Syntax Rio, in collaboration with Habidatum. Each iteration of Storefront’s Productive Disagreement Series develops conversations between ideologically opposed individuals, teams, or institutions. The events avoid compromise and agreement as a methodology of dialogical exchange, and promote confrontation and dialogue in order to generate a responsive audience, increase participation, and obtain a multiplicity of viewpoints and strategies. Alexandre Cardeman is the CEO of Centro de Operações Rio (COR), and a technology project manager with more than 30 years of experience in the public sector. Cardeman is directly engaged in the COR project since the first steps of planning, through to its construction and operations implementation. Cardeman is specialized in public policy and smart city technologies. Heather Dewey-Hagborg is a transdisciplinary artist and educator who is interested in art as research and critical practice. Her controversial biopolitical art practice includes the project Stranger Visions in which she created portrait sculptures from analyses of genetic material (hair, cigarette butts, chewed up gum) collected in public places. Her work has been shown internationally at events and venues including the World Economic Forum, Shenzhen Urbanism and Architecture Biennale, the New Museum, the Centre Pompidou and PS1 MOMA. Projects by Dewey-Hagborg have been widely discussed in the media, from the New York Times and the BBC to TED and Wired. She is an Assistant Professor of Art and Technology Studies at the School of the Art Institute of Chicago and a 2016 Creative Capital award grantee in the area of Emerging Fields. 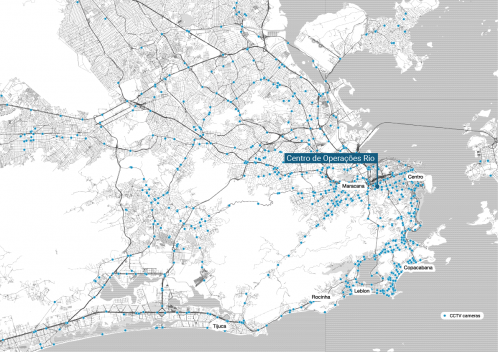 Habidatum, a group of urban data analysts, will present Rio Semantic Landscapes: Beyond Control Syntax?. The project presents alternative methods of surveillance, collection, and analysis of urban data gleaned from social media usage in Rio to question if ‘smart city’ technologies lead to safer or happier cities, if individual expression may subvert larger systems of control beyond the purview of the state, and how emerging cartographic softwares provide new tools for understanding spatial syntax and the organization of the city. Alexei Novikov, is President of Habidatum and holds a PhD degree in Regional and Urban Studies. He has been research fellow and visiting professor of urban science in American and European universities. Novikov launched two other startups: EA-Ratings and Geograffity. Prior to Habidatum he was a Managing Director at Standard & Poor’s and at Thomson Reuters. He also consulted the World Bank and other international financial organizations on infrastructure finance. William McCusker is Product Lead & Business Development Director at Habidatum, and leads product strategy, project management, and business development initiatives. Prior to Habidatum, William coordinated the development of The Atlas of Urban Expansion, an online data visualization tool for an initiative involving New York University, the Lincoln Institute of Land Policy, and the United Nations Human Settlements Programme. Lev Manovich is one the leading theorists of digital culture worldwide, and a pioneer in application of data science for analysis of contemporary culture. He is the author and editor of ten books including Cultural Analytics (forthcoming), Instagram and Contemporary Image, Data Drift, Software Takes Command, Soft Cinema: Navigating the Database, and The Language of New Media. Manovich is a Professor of Computer Science at The Graduate Center, CUNY, and a Director of the Cultural Analytics Lab. The lab created projects for MoMA (NYC), New York Public Library, Google, and other organizations. Manovich received an M.A. in Visual Science and Cognitive Psychology at NYU and a Ph.D. in Visual and Cultural Studies from University of Rochester. Manovich has been working with computer media as an artist, computer animator, designer, and programmer since 1984. Rodrigo Rosa is currently Visiting Scholar for Columbia University, after eight years working as Special Advisor of the Mayor’s Office of the City of Rio de Janeiro under the administration of former Mayor Eduardo Paes. As part of that administration, Rosa was involved with major transformative projects including the Port Renovation (a large expansion of health care, education, and transportation) and the Rio Resilient City plan. He took part in high level coordination of major international events, such as the World Cup in 2014, the Summer Olympic Games in 2016, the United Nations Conference Rio+20, TED Global, among others. As Special Advisor of Chairman Eduardo Paes during the C40 Cities Climate Leadership Group, Rosa executed strategies to largely expand the network, connecting to cities in China and in the developing world. Rosa was intensely engaged in international city diplomacy, advocating the voice of cities on the global stage. Previously, he worked in the public sector as a legislative consultant to the Brazilian Federal Senate, where he worked crafting legislation in Brazilian Congress before joining Rio City Hall. Rodrigo holds a Masters Degree in Economics and environmental management and is a PhD candidate at the Federal University of Rio de Janeiro on energy and sustainable planning. Blake Shaw is a media artist who works at the intersection of video, critical pedagogy, telecommunication technology, and public space intervention. His work involves the construction of situations that facilitate collaborations between activists and artists around experimental media in attempts to instigate political novelty. His works and performances have been exhibited at a wide range of venues, including: The Akademie der Künste Berlin, The National Gallery of Denmark, The Centre for Art on Migration Politics, The Museum of Contemporary Art Zagreb, Den Frie Centre of Contemporary Art, Qalandyia International, The Media Architecture Biennale, The Museum of the Moving Image, among others. He has won numerous awards for his work, including a Vimeo Award. His works have been featured in a variety of publications including The Atlantic, Huffington Post, The Creators Project and The New York Times. Mark Wasiuta is Co-Director of the MS degree program Critical, Curatorial and Conceptual Practices in Architecture at Columbia GSAPP. Over the last decade, as Director of Exhibitions at GSAPP, he has developed a body of research and archival exhibitions that focus on under-examined practices of the postwar period. Recent exhibitions, produced with various collaborators, include “Every Building in Baghdad: The Rifat Chadirji Archives at the Arab Image Foundation,” “Environmental Communications: Contact High,” “Information Fall-Out: Buckminster Fuller’s World Game,” and “Les Levine: Bio-Tech Rehearsals 1967-1973.” His work has appeared at the Graham Foundation, the Istanbul Design Biennial, the Venice Architecture Biennale, Het Nieuwe Instituut, the Chicago Architecture Biennial, and elsewhere. He directs Collecting Architecture Territories, a multi-year research program that analyses global art institutions that have emerged from private collections. Wasiuta is recipient of recent grants from the Asian Cultural Council, the Graham Foundation, and NYSCA. Storefront’s programming is made possible through general support from Arup; DS+R; F.J. Sciame Construction Co., Inc.; Gaggenau; Knippers Helbig; KPF; MADWORKSHOP; ODA; Rockwell Group; Roger Ferris + Partners; Tishman Speyer; the Foundation for Contemporary Arts; The Greenwich Collection Ltd.; the Lily Auchincloss Foundation; the New York State Council on the Arts with the support of Governor Andrew Cuomo and the New York State Legislature; public funds from the New York City Department of Cultural Affairs in partnership with the City Council; The Peter T. Joseph Foundation; and by Storefront’s Board of Directors, members, and individual donors.